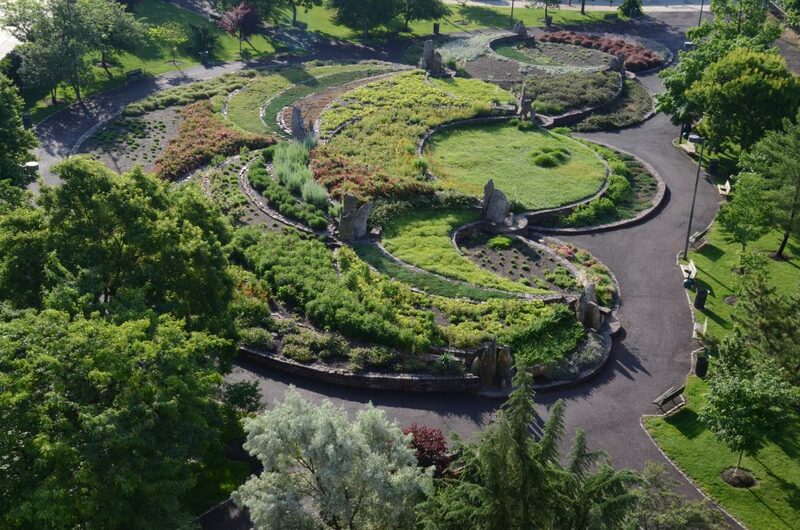 The Fairmount Park Conservancy works collaboratively with outstanding community members through projects in Philadelphia’s network of parks. 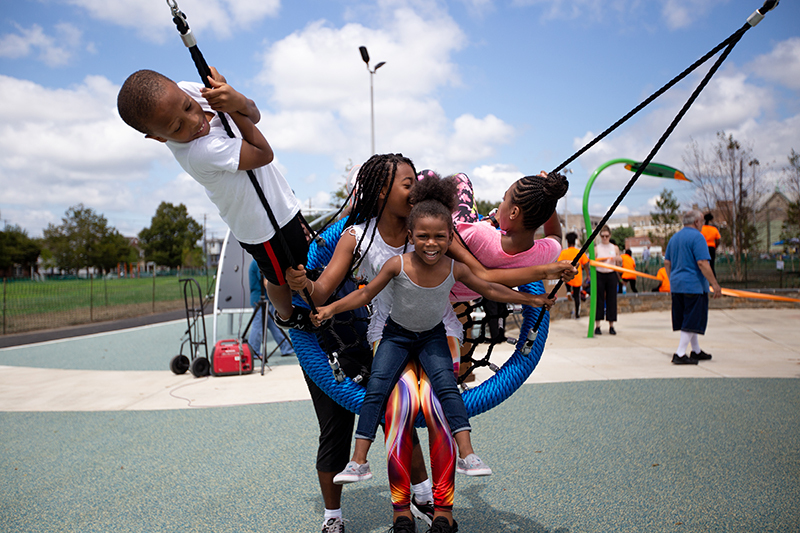 Together, we are maintaining and transforming neighborhood green spaces into community assets. In fall 2010, Heidi Grunwald, her mountain biking boyfriend Kenn Rymdeko and their pal Harlan Price met with Philadelphia Parks & Recreation Director of Development, Ed Fagan. The trio proposed a pumptrack in Philadelphia, a small, dirt course designed for bicycling without pedaling. The proposed track would include a trail system of raised banks, smooth mounds for pumping, and crater-like bowls. Grunwald and her partners raised over $41,000 and overcame numerous obstacles to create what is now the Philly Pumptrack. 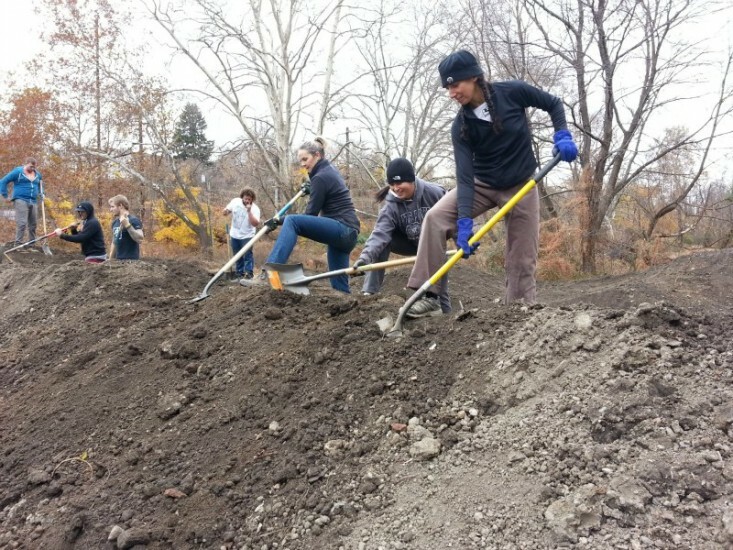 The Fairmount Park Conservancy, Philly’s non-profit park champion, contributed $6,000 through two grants for programming and physical improvements to help the Pumptrack get started. Grunwald took time away from her bike to chat with the Fairmount Park Conservancy’s SJ Punderson about her story. SJ Punderson: How did you get involved in the Philly Pumptrack project? 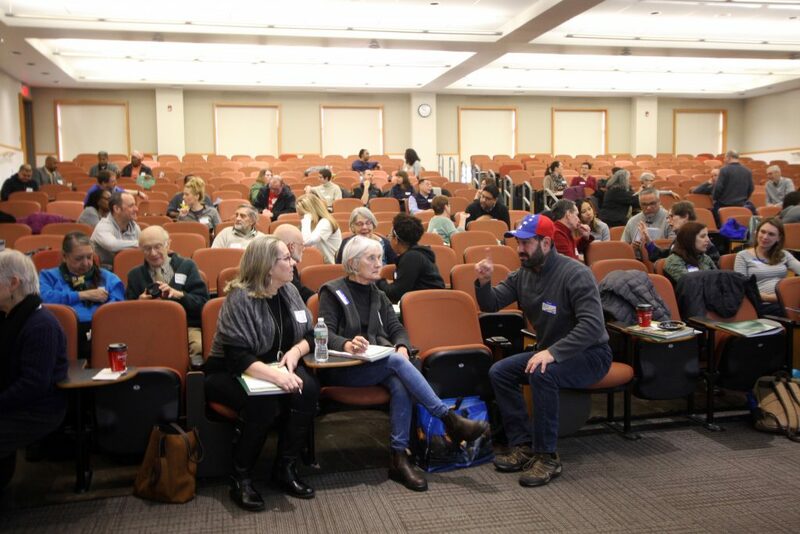 Heidi Grunwald: There used to be a vibrant mountain biking community, the Philly Mountain Biking Association, and we were kicking around the idea of building a pumptrack or a bike park in the city. The club went defunct. Ken, Harlan and I thought it would still be cool to build a pumptrack, so I told them if they put a plan together, then I’d pitch the city and raise the money. SJP: What makes the Philly Pumptrack such a special place? HG: I work at Temple, so every day when I’m either driving or taking the train I see urban kids riding their bikes in the street with nowhere to go. We wanted to bring kids like that into a safe place that would provide community and health. We have rain gardens and the track is designed so the water flows away from it and underneath the track. We have a water catcher that drains the water into a generator and a pump that uses the rainwater to water the track each day. SJP: What was your personal interest in this project? HG: I come from athletics and grew up playing a ball sport, volleyball. But most of the guys that I hang with are non-traditional athletes- they mountain bike, skateboard, BMX. This is a place for kids that don’t play traditional sports. “No one sits on the bench,” is a saying we have at the Pumptrack. SJP: Can you walk me through the steps, from conceptualization to completion? HG: In the fall of 2010 we pitched a 10 slide presentation to Parks & Rec. We submitted grants in October and November and were holding grant dollars for a long time. We toured a list of sites and prioritized a site in the Juniata neighborhood. All of 2011 was the Juniata process, and then because of pushback from the community, we decided not to build there. When they heard ‘bikes’ they thought that meant loud music and drugs, so we moved on. In 2012, we started at Parkside and thought we might get shovels in the ground but then we hit all kinds of issues. It needed a site survey, a site surveyor, engineer, landscape architect, builder and insurance, which took another nine months. In the meantime, Parks & Rec had dumped dirt and concrete at the Parkside site from the Paines (Skate Park) excavation, but we didn’t have permission to build until late 2013. It only took six months to build, and the pumptrack opened in May of 2014. SJP: What channels did you go through to get the project off the ground? HG: After we got the first two grants, we continued to fundraise. With help from Ed and Parks & Rec, we selected the Parkside site. The residents there were immediately receptive. We did hit a few bureaucratic obstacles along the way. I had a long debate with the city about fencing. We were told we had to put up wire fencing, like the kind that is used at tennis courts. We refused. The Pumptrack is a place that welcomes all types of people, and it doesn’t keep anyone in or out. The compromise was split-rail fencing. SJP: Could you talk about funding the project? HG: Harlan and Ken were connected to the Philly cycling industry and Patrick Cunnane from Advanced Sports gave us a suite of bikes. You just open your rolodex and ask yourself who do I know that knows somebody that knows somebody who can donate something? Our initial grants were from the People for Bikes and Specialized. Someone at the Navy Yard who I still haven’t met coordinated a 40 foot shipping container for us to store the bikes in and the transportation to the Pumptrack for free. Without that, there is no pumptrack, or there’s a pumptrack with no bikes. SJP: What should someone expect when they show up at the Pumptrack? HG: You sign a waiver and helmets and bikes are provided for free. If you don’t have any idea at all of what you’re doing, you can ask someone at the desk and they’ll be able to give pointers or lessons on the beginner track. Pumptracks are designed to flow, like roller coasters, so you shouldn’t have to pedal much and your wheels shouldn’t leave the ground. The rule is, you have to make it around the beginner track six times before you can ride on the advanced track. We encourage everybody to get the feel of it first. It’s an incredible workout. SJP: What are the ultimate goals for the project? HG: We would like the community to become even more involved in the Pumptrack and we’d like to fundraise to send some of our best riders to Camp Woodward, a world renowned sleep-away camp in Central Pennsylvania. SJP: Have you been involved in community projects/activism your entire life? HG: This is certainly the first project I’ve worked on that involved brokering relationships with the city. It was, for sure, the most challenging part of the project. When I would want to quit, Ed (Fagan) would talk me out of it. When he would want to give up, I would do the same for him. SJP: Any tips for people who would like to pull off their own community project in Philly? HG: Don’t be shy. Ask questions. Go find someone to pitch your idea to until you find a champion. SJP: When did you start mountain biking? HG: I was 27 and living in Florida, touring the professional beach volleyball circuit and had just won a U.S. National Championship. My mom was visiting and asked, “Would you come with me, I want to buy a bike?” So we walked into this bike shop near Tampa and my mom was buying a hybrid and I was checking out the mountain bikes, eyeing the shocks. I bought a bike that day, in Florida, which doesn’t sound very challenging, but in fact the riding is super technical because it’s sandy, it’s rooty, there’s swamps, gators and spiders as big as your hand. The dense bush, palmettos and live oaks in the equatorial forest are home to huge feral hogs. I’d happen upon them and know right away if they had piglets. If they did, I’d get off my bike and walk backwards. Eventually, I moved to Michigan for my PhD. I was never so happy to move north, mostly because of the mountain biking. In Michigan, there’s just dirt and the scariest thing in the forest is deer. SJP: What is there for women, specifically, at the Pumptrack? HG: There was a 12 year-old girl who started coming to the Pumptrack with her brother, who was an OK rider. She came because she wasn’t allowed to be at the house alone. She didn’t get anywhere near the track the first ten times they came. Finally, I got her out there and she was really bad, really stiff, really fearful. We went slow and took it easy on the beginner track, which isn’t as intimidating. Now, she owns her bike and rides the advanced track. She jumps on her bike whenever she feels like it. In terms of women-specific programming, there are several weekend dates for ‘Ladies at the Pumptrack with Women Bike PHL’ (6/14, 7/13, 8/9 and 10/17). SJP: What’s next for the Pumptrack? HG: We want the community to be more involved so that more community members know it’s here. Some of our kids are graduating to mountain biking, so we’re actually going to be building a dirt connector trail to the Belmont Plateau, about one mile from the Pumptrack. We want to focus on the whole family experience too so that parents and smaller kids will be able to walk the dirt trails and explore nature. SJP: What’s an ideal day in the Philadelphia park system for you? HG: I’m a mountain biker primarily. Leaving my house on my bike with a friend or two and dropping into the Wiss on a spring or fall day, about 60 to 70 degrees outside, is great. It doesn’t matter for how long: one, two or three hours.